Do you have a chipped windshield? Jones Paint & Glass offers rock chip repair at our auto glass service locations. Visit a location near you. Have you never experienced auto glass repair through Jones Paint & Glass before? Receive one free rock chip repair during your first service. Call for details. We take glass seriously, which is why we protect your investment by offering a lifetime of FREE rock chip repairs when you install a windshield through Jones Paint & Glass. Your windshield is important for the structural integrity of your car. If you experience a windshield replacement service that uses an inferior adhesive, your windshield may not provide you with the safety and protection it should. One bad windshield installation can be the difference between whether or not an accident causes serious injury. Jones Paint & Glass takes windshield safety very seriously, which is why we strictly follow mandated installation and drive-away guidelines to ensure you have full confidence after we install your windshield. We are picky about our adhesives, and have chosen Sika, the best and safest windshield adhesive in the industry. 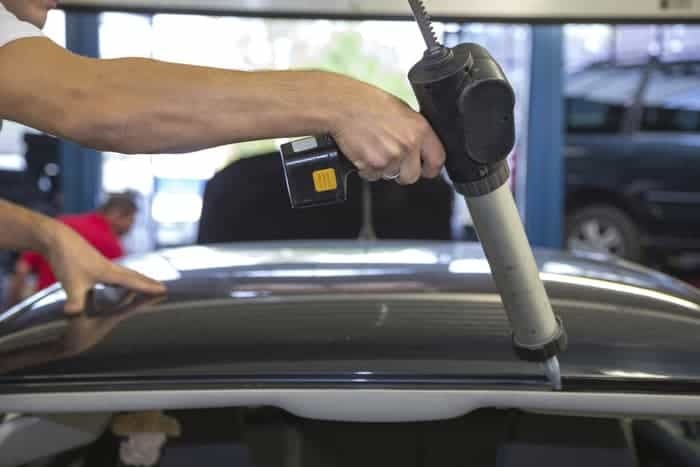 While lower quality adhesives require up to one-day of sitting time before you’re able to drive your car again, Jones Paint & Glass’ use of Sika means you can safely and confidently drive away one hour after windshield replacement. For more information, watch Sika’s video on windshield safety. Call today for a free quote on replacing your windshield. 1-800-748-5030 or send us a message for a FREE ESTIMATE!